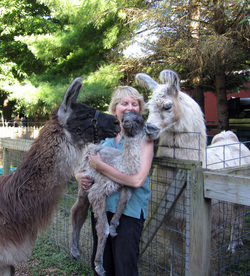 Scott and I were blessed with getting to know a very handsome baby llama we named Heartsong Kerry Blue. He was born on June 29, 2010 in the late afternoon. His momma, Cresta Butte MWF, was not able to mother him quite like she should. We still to this day do not know what was wrong with Cresta. Our veterinarians were not able to get it sorted out either. 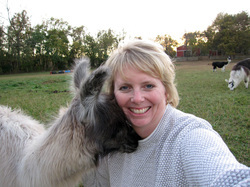 To start with, our incredible llama, LUA Moonliter's Heartsong, took it upon herself to encourage Kerry Blue to stand, and she gently nudged him one careful step at a time over to the side of his inattentive mother. When he tried to nurse from her chest, Heartsong moved him down to Cresta's back end. 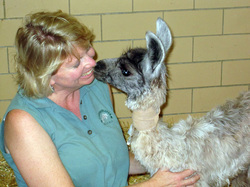 We sat just mesmerized as we watched this lovely llama soul who took it upon herself to help Kerry in his first hours. If Heartsong had been in milk, we're fairly certain she would have nursed him. As it turned out, Kerry Blue didn't get enough colostrum in those critical early hours, and within a few days he had sepsis. We took him and Cresta to the Purdue Large Animal Hospital. The amazing Dr. Kristi Goncarovs and the team of veterinary students and technicians brought him through his troubles. Two weeks later, we brought them home to the farm. From the beginning, Kerry Blue, was a kind and loving soul. We followed everyone's advice not to over handle him, especially since he was a male cria and we didn't want him to get too pushy. But he managed to wiggle his way into absolutely everyone's heart. Then his mom started acting unsteady so we immediately headed back to Purdue. She was gone the next day despite their efforts to help her. So Kerry Blue rode home alone in the back seat of my truck. He was five weeks old. We worked and worked to balance his nutrition and to make sure he was gaining weight. Our friends at the hospital were tremendous in their response to Kerry's needs and to all of our many questions. He was a little tricky at first because he wasn't at all interested in milk that wasn't from his mother. 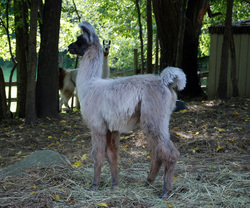 A cria that has spent five weeks nursing is much harder to switch to a bottle or over to drinking milk from a bucket. We relied on high quality hay and Mazuri llama feed (pellets). I spent many an evening sitting in the llama pen holding a flake of hay so that Kerry could be sure to get his own portion. He was such a talker -- always gently humming all the way through his dinner. It was as if he was having a conversation with you. 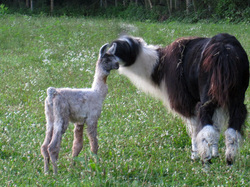 He was our only cria born on the farm in 2010, and I didn't want him to grow up without a friend. I particularly didn't want to isolate him in his own field without friends when he grew old enough that he would need to be separated from the females. So I found two friends for him at Hard Rock Llama Company in Ohio. I brought them home in early October along with their dams. Kerry and Primary Colors became fast friends immediately. They were so cute together. Kerry liked Blanco too, but Colors was more his size and had lost a bunch of his fiber in the summer so he had his own little temporary disability. I think Kerry could relate to Colors in his own llama ways. But on a Saturday morning late October, our Kerry's little head and neck dropped low to the ground and he looked a little uncomfortable. Almost neurologic - like he didn't quite know where his feet were. We took him back to Purdue. They did an x-ray and found that he had a secondary infection that had settled high in his neck. (The infection was secondary to the sepsis he had as an infant cria.) The infection had caused extra bone growth in his vertebrae. They offered many options, but we opted to put him down on Nov. 2, 2010. The necropsy showed that the extra bone growth had damaged his spinal cord. We are so grateful for the four short months we had with Heartsong Kerry Blue in our lives. We learned a lot about llamas from the experience. But the best of it all was simply knowing Kerry. He was always joyful. It didn't seem to matter how dire his circumstances, he always chose joy. He always looked for a new friend, a new game to play, a new food to try, a new way to make his human mom laugh. I praise God for the distinct honor of being his caregiver for his fruitful four months. We still miss him. Kerry is about a day old in this photo. This is the family picture! 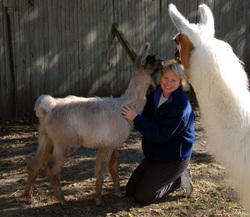 His mom, Cresta is on the left, and his sire, FFF Mas Chiri is on the right. I'm looking a tad bit exhausted as I'd been up most of the night checking on him to make sure he was nursing. Since I work at Purdue, it gave me opportunity to go and visit Kerry on my lunch hour or after work in the evening while he was at the Large Animal Hospital. Kerry Blue spent a lot of time near Heartsong, who loved him as much as his own dam. 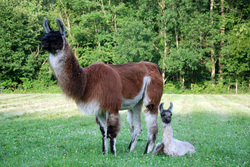 As is common in a llama herd, he was well protected by the adult females. Heartsong Kerry Blue with his dam, Cresta Butte MWF. I love this photo of Kerry -- so handsome. I was looking forward to showing him. He had all sorts of champions in his background and had great potential. A Saturday morning with Kerry and Betty (foreground). Silver Fortune was not interested in letting Kerry Blue nurse from her. So, whenever Primary Colors would nurse from Fortune, Kerry would try to nurse from Colors!